The cost of home foundation repair has more to do with the long term costs verses the short term cost. What will it cost me if I do not do the foundation repair work, is the better question when deciding if you are going to hire a foundation repair contractor. Will not doing the repairs cost me more later? Taking care of your homes foundation maintains your home's value. If your foundation is about to collapse the rest of your home is soon to follow. 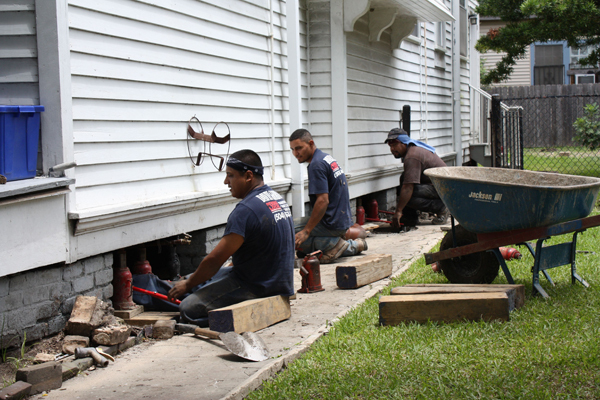 Putting off home foundation repairs will always cost you more in the long run. As soon as you think that you may need repairs you only have two options, first, do I hire a foundation engineer? Second, do I hire a foundation repair specialist? While both may be needed, the order that you hire them is dependent upon the circumstances. If you have settlement or other structural issue hiring a foundation engineer is the best course of action. If your doors or windows are sticking, your foundation has large cracks and ruptures or you have major visual damage hiring an engineer can save you money. Hiring an engineer not only provides you with a person with your best interest in mind but also an expert to oversee the repairs being done. If you have smaller cracks or other signs of preliminary movement, hiring a foundation repair expert to give you an evaluation becomes the smartest move. A qualified foundation repair expert that has been trained in repairing your home can provide you with the best method of repair at a reasonable price. The contractors take many factors into consideration when calculating the estimate for the repair of your foundation. After they have done their initial inspection, they will assess the damage and determine how long it will take to fix the foundation. Other than the labor cost the estimates will also depend on the type of material will be used, as well as the cause of the damage. While he does not have the education and training that an engineer has, a good quality foundation repair contractor can steer you in the right direction in determining the extent of the damage along with its cause. So now the real question - what is this going to cost me? The answer is as vague as the question is. What is the extent of the damage, what type of foundation is it, what other areas of the home have been impacted and what has to be done are the questions that need answered by qualified professionals. Then, and only then, can the question of actual costs be answered. Remember repairing your home is one of the areas where you get what you pay for. Quality repairs can be done for a couple hundred dollars for minor repairs or tens of thousands of dollars for major repairs. Do your research and interview an engineer and or a foundation contractor or two before making any decisions. Education is the key to not over paying for foundation repairs. Knowing the signs of problems, hiring an engineer that evaluates then oversees the repairs and understanding the cause of foundation problems will prevent you from wasting your hard earned money. Research and education will also make sure that you can spot a quality foundation repair job when it is complete. Today, there have been 46 visitors (77 hits) on this page!